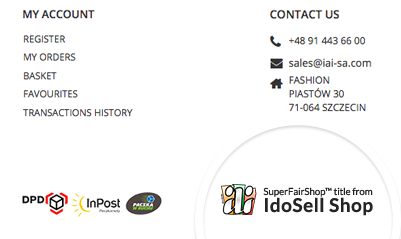 SuperFair.Shop™ title is awarded to shops meeting all the requirements. Depending on the business branch, it is possible to include or exclude individual targets within the module. In extreme cases, assuming a store meets all goals, yet somehow has violated the IdoSell Shop Terms and Conditions, this title may be withdrawn. IdoSell Shop runs a SuperFair.Shop ™ program, where we appreciate the best online stores that provide their customers with fast, convenient and safe shopping. For this purpose, we have created clear criteria, once an online store meets them, the SuperFair.Shop™ title is awarded. We focused on the most important aspects from the customer's point of view - order handling time, variety of payment systems and couriers to choose from, security, and after-sales service. What does SuperFairShop™ award mean for an online store customer? Who can apply for the SuperFair.Shop™ award? SuperFair.Shop title is awarded to shops meeting all the requirements above. Depending on the business branch, it is possible to include or exclude individual targets within the module. In extreme cases, despite the fact that the store met all the criteria but violated the regulations of the IdoSell Shop service, the award may be withdrawn. Special logo prepared for the best shops, appears in the footer instead of the standard logo (hidden when the White-Label option is enabled) and leads to a site that helps to build trust. We do not grant a license to use the logo ''manually'', as the title is generated automatically, based on recent panel operations. Surely the above list is not final. If we choose to add another criterion, it will affect the already given awards. However, over time, we expect the title to gain even more importance. Therefore, when introducing further requirements for SuperFair.Shop ™, a grace period and appropriate customer information policy should be considered. Do you have questions about SuperFair.Shop ™?